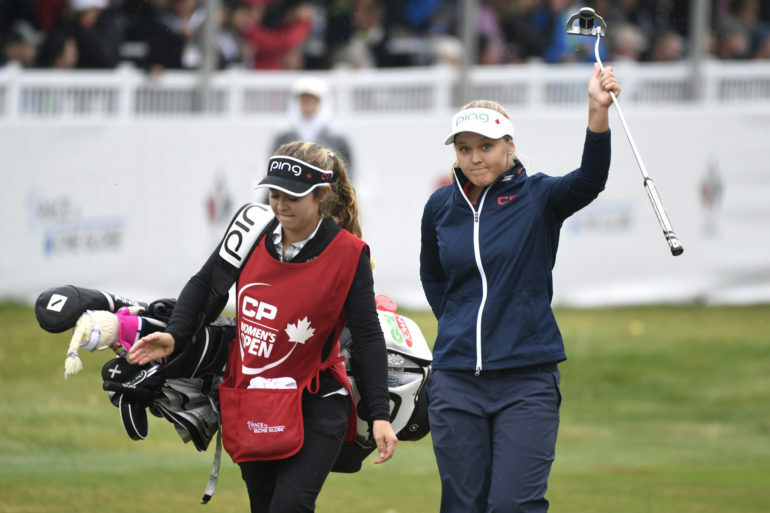 TORONTO – Brooke Henderson’s two LPGA Tour victories in 2018, including her historic win on home soil at the CP Women’s Open, earned her two additional honours to add to her rapidly-expanding resumé. The Golf Journalists Association of Canada (GJAC) has announced Henderson, Adam Hadwin, Garrett Rank and Jaclyn Lee as its 2018 Players of the Year as voted by GJAC members across the country. Henderson’s victory at the national open, the first by a Canadian in 45 years, was also voted Canadian Golf Story of the Year by an overwhelming margin. Henderson’s triumph at Wascana Country Club in Regina, Sask., which was punctuated by a 72nd hole birdie to give her a four-stroke win over American Angel Yin, was the second win of a two-victory season (her other title came four months earlier at the Lotte Championship) that propelled her to a runner-up finish in the Race to the CME Globe. The 21-year old’s seven LPGA wins put her one title behind Mike Weir, George Knudson and Sandra Post for most all-time by a Canadian professional. Adam Hadwin was named Male Professional of the Year after continuing his ascendancy as one of the world’s premier players, notching 10 top-25 results for the 2017-18 PGA TOUR season and finishing 36thin the FedExCup Standings. He and fellow Abbotsford, British Columbia product Nick Taylor also lifted Canada to a T4 finish at the World Cup of Golf, the nation’s best finish at the event since 1985. Calgary’s Jaclyn Lee earned honours as Female Amateur of the Year after a standout season that culminated with a sixth-place finish at the LPGA’s Q-Series, earning her a tour card for her first professional season in 2019. The former Golf Canada National Amateur Team and Ohio State standout had a strong final season as an amateur, reaching the semifinals of the Ladies British Open Amateur Championship and the quarterfinals of the U.S. Women’s Amateur. Finally, Elmira, Ontario’s Garrett Rank earned Male Amateur of the Year honours after a remarkable run that included qualifying for the U.S. Open – earning the NHL Referee widespread attention and media coverage – and victories at the Ontario Mid-Amateur and Ontario Amateur, along with top-three results at the Canadian Amateur and Canadian Mid-Amateur.